Loaded with Amenities & Features. Purpose-Built Storage. Eye-Catching Design. All Key Largo Boats are NMMA Certified built to the most stringent ABYC Standards. KEY LARGO BOATS are built for Family, Fishing and just plain FUN! In fact, Key Largo Boats are great for anything the lakes, bays and rivers of New York State have to offer. Key Largo sport fishing boats handle exceptionally well in a wide variety of sea conditions. Used by serious sportsmen, professional anglers and active families that demand practical features, reliability, and durability. That’s why Key Largo hand builds the toughest most versatile sport fishing boats imaginable, backing every boat with a warranty second to none. At Trade-a-Yacht, we are proud to represent Caravelle’s quality line of Key Largo boats in Upstate New York. Come aboard and experience the excitement of the amazing Caravelle Key Largo! Check out the features on all the Caravelle Power Boats for 2017 below. 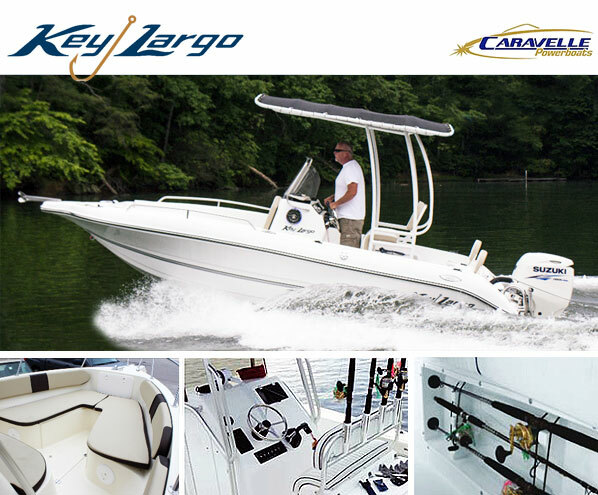 Caravelle Key Largo Boats Models & Specs. Escape the Ordinary with Key Largo! The Caravelle Key Largo sport boats are an escape from stress, worries and the everyday routine! Key Largo Boats are your escape ticket to relaxation, fun and unbound adventure. Boating creates the opportunities to focus on the people you care about, creating endless memories and most importantly, your enjoyment. “Boating is all about making the most out of every moment on the water”. From day one, Key Largo has implemented a policy that our owners come first! Crafting every NMMA Certified Key Largo by hand with only the best materials and procedures to insure our owners are getting a boat to deliver the experience expected of a Key Largo.